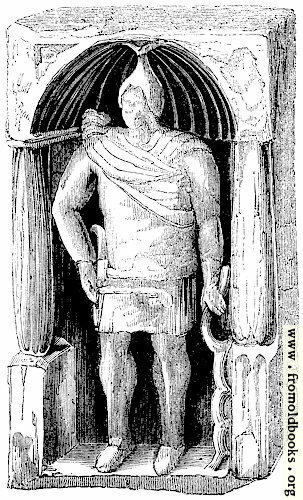 The Roman Wall—the Wall of Agricola—the Wall of Hadrian—the Wall of Severus—the Picts’ Wall—the Wall, are various names by which the remains of a mighty monument of the Romans in England are called by various writers. 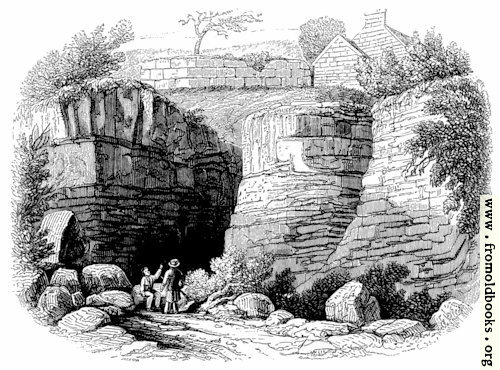 William Hutton, the liveliest and the least pedantic of antiquarians, who at seventy-eight years of age twice traversed the whole length of the Roman Wall, denominates it “one of the grandest works of human labour, performed by the greatest nation upon earth.” From a point on the river Tyne, between Newcastle and North Shields, to Boulness on the Solway Frith, a distance of nearly eighty miles, have the remains of this wall been distinctly traced. It was the great artificial boundary of Roman England from sea to sea; a barrier raised against the irruptions of the fierce and unconquerable race of the Caledonians upon the fertile South, which had received the Roman yoke, and rested in safety under the Roman military protection. The Wall, speaking popularly, consists of three distinct works, which by some are ascribed to the successive operations of Agricola, of Hadrian (Figs. 144, 145), and of Severus. The Wall of Antoninus (Figs. 146, 147), now called Grimes Dyke, was a more northerly entrenchment, extending from the Clyde to the Forth; but this rampart was abandoned during subsequent years of the Roman occupation, and the boundary between the Solway Frith and the German Ocean, which we are now describing, was strengthened and perfected by every exertion of labour and skill. Hutton may probably have assigned particular portions of the work to particular periods upon insufficient evidence, but he has described the works as they appeared forty years ago better than any other writer, because he described from actual observation. We shall, therefore, adopt his general account of the wall, before proceeding to notice any remarkable features of this monument. “There were four different works in this grand barrier, performed by three personages, and at different periods. I will measure them from south to north, describe them distinctly, and appropriate each part to its proprietor; for, although every part is dreadfully mutilated, yet, by selecting the best of each, we easily form a whole; from what is, we can nearly tell what was. We must take our dimensions from the original surface of the ground. “Let us suppose a ditch, like that at the foot of a quickset-hedge, three or four feet deep, and as wide. A bank rising from it ten feet high, and thirty wide in the base; this, with the ditch, will give us a rise of thirteen feet at least. The other side of the bank sinks into a ditch ten feet deep, and fifteen wide, which gives the North side of this bank a declivity of twenty feet. A small part of the soil thrown out on the north side of this fifteen-feet ditch, forms a bank three feet high and six wide, which gives an elevation from the bottom of the ditch of thirteen feet. Thus our two ditches and two mounds, sufficient to keep out every rogue but he who was determined not to be kept out, were the work of Agricola. “The works of Hadrian invariably join those of Agricola. They always correspond together, as beautiful parallel lines. Close to the north side of the little bank I last described, Hadrian sunk a ditch twenty-four feet wide, and twelve below the surface of the ground, which, added to Agricola’s three-feet bank, forms a declivity of fifteen feet on the south, and on the north twelve. Then follows a plain of level ground, twenty-four yards over, and a bank exactly the same as Agricola’s, ten feet high, and thirty in the base; and then he finishes, as his predecessor began, with a small ditch of three or four feet. “Thus the two works exactly coincide; and must, when complete, have been most grand and beautiful. Agricola’s works cover about fifty-two feet, and Hadrian’s about eighty-one; but this will admit of some variation. “Severus’s works run nearly parallel with the other two; lie on the north, never far distant; but may be said always to keep them in view, running a course that best suited the judgment of the maker. The nearest distance is about twenty yards, and greatest near a mile; the medium, forty or fifty yards. “They consist of a stone wall eight feet thick, twelve high, and four the battlements; with a ditch to the north, as near as convenient, thirty-six feet wide and fifteen deep. To the wall were added, at unequal distances, a number of stations, or cities, said to be eighteen, which is not perfectly true; eighty-one castles, and three hundred and thirty castelets, or turrets, which, I believe, is true: all joining the wall. 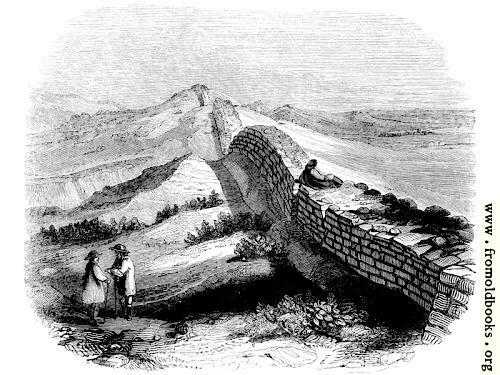 “Exclusive of this wall and ditch, these stations, castles, and turrets, Severus constituted a variety of roads yet called Roman roads, twenty-four feet wide, and eighteen inches high in the centre, which led from turret to turret, from one castle to another; and still larger and more distant roads from the wall, which led from one station to another, besides the grand military way before mentioned, which covered all the works, and no doubt was first formed by Agricola, improved by Hadrian, and, after lying dormant fifteen hundred years, was made complete in 1752. “I saw many of these smaller roads, all overgrown with turf; and when on the side of a hill, they are supported on the lower side with edging stones. “Thus Agricola formed a small ditch, then a bank and ditch, both large, and then finished with a small bank. “Hadrian joined to this small bank a large ditch, then a plain, a large mound, and then finished with a small ditch. 131.—Wall of Severus Near Newcastle-upon-Tyne. 132.—Wall of Severus, near Housestead, Northumberland. 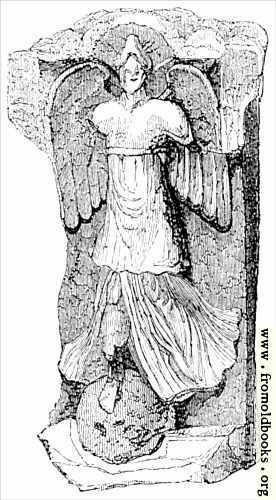 The Wall of Antoninus, or Grimes Dyke, to which we have already referred, was carried across the north of Britain, under the direction of Lollius Urbicus, the legate of Antoninus Pius, about the year a. d. 140. It is noticed by an ancient Roman writer as a turf wall; and although its course may be readily traced, it has, from the nature of its construction, not left such enduring remains as the Wall of Severus. The Wall of Antoninus connected a line of Roman forts; and these were necessarily built of substantial materials. Duntocher Bridge, on the line of this wall, was long popularly considered to have been a Roman work; but it has been more reasonably conjectured to have been a very ancient work, constructed out of materials found on the line of the wall (Fig. 148). The military way in some places runs parallel with Grimes Dyke. The ditch itself presents in some places a wonderful example of the Roman boldness in engineering. At a part called Bar Hill, Gordon describes “the fossa running down in a straight line from the top of the hill in such a magnificent manner as must surprise the beholder, great part of it being cut through the solid rock, and is of such a vast breadth and depth, that when I measured it it was no less than forty feet broad and thirty-five feet deep.” The surprise of Mr. Gordon was before the age of railways: the time may perhaps arrive when the deep cuttings and tunnellings through the solid rock in the nineteenth century shall be compared with the Roman works of the second century, by new races of men who travel by other lines or with different mechanism. But, however obscure may then be the history of our own works, it is quite certain that we shall have left our traces upon the earth; some consolation, though small, to balance the reflections which are naturally suggested when we look upon the ruins of populous cities and mighty defences, and consider how little we know of their origin, of the people who built them, and of the individual life that was once busy in these solitary places.